The death of Staff Sgt. Alex Conrad puts into sharp relief the cost of the U.S.’s long fight against the militant group. The U.S. commandos careened between grief and anger as Alex Conrad’s flag-draped coffin was hoisted onto the cargo plane. Al-Shabaab militants allied with al Qaeda had killed Staff Sgt. Conrad at a rudimentary outpost that American Green Berets built with help of the Somali army. Now, just as Sgt. Conrad’s comrades were sending him on his final trip home, they were grappling with more bad news. The Somali army had abandoned the outpost hours after the sergeant died. The Green Beret commander frantically called a senior Somali official. “We lost lives there,” the Green Beret said. “It’s not acceptable to give it back.” America’s war against al-Shabaab is one of the longest-running conflicts in U.S. history, simmering quietly for a dozen years in the desert landscape of the Horn of Africa. It has proven a frustrating mission with wins but no victory, setbacks but no defeat. Its limitations were apparent just this week, when al-Shabaab claimed responsibility for an 18-hour siege that left at least 21 victims—including one American—and five attackers dead at a hotel-and-office complex in Nairobi, Kenya. Somalia is one in a series of American wars unleashed by the Sept. 11 attacks, from Afghanistan and Syria to Niger and Yemen. On any given day, across a swath of Africa, South Asia and the Middle East, hundreds of U.S. troops might find themselves dropping bombs on or exchanging gunfire with any number of armed Islamist organizations—al-Shabaab, Islamic State, the Taliban, the Haqqani network and al Qaeda’s branches in the Maghreb or the Arabian Peninsula. Five Justices defend the Constitution against anti-Trump passions. Donald Trump is so polarizing that a test of his Presidency is whether American institutions can keep their bearings and hold to principle despite the passions of the moment. Five Supreme Court Justices did the country a service on Tuesday by sticking to the Constitution and rule of law on executive power rather than succumb to the temptation to rebuke an unpopular President’s dubious policy. 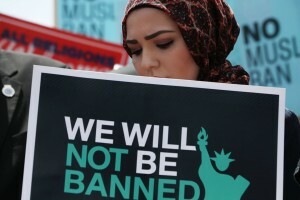 A 5-4 majority upheld Mr. Trump’s third “travel ban” from 2017 that restricted entry to America from eight countries. The ban in our view isn’t necessary, and the Court made no judgment on the policy merits. But Chief Justice John Roberts and four conservative Justices found that the ban falls well within the President’s core national-security powers. This is less a victory for Mr. Trump than for the ability of future Presidents to defend the country.